1LGM Limited is the holding company for the entire business group. Based in Coventry in the heart of the UK, the group has varied interests under its control. Once an idea or proposal has been considered and approved it is assigned to one of the group businesses. First formed in 1981, Status Alarms Limited was the first part of the 1LGM Group. Status Alarms Limited is a fully approved NSI GOLD MEMBER for Intruder Alarms, Closed Circuit Television and Door Access Control Installations. A privately owned local company employing local people, with over 30 years of qualified experience within the Security Industry, offering full installation after care and support for all security needs. Status Alarms has over 11,500 clients locally and can boast of holding the position as main contractor to a Local City Council for the past 28 years covering all aspects of their security requirements. It is also the main contractor to a Local University covering all aspects of their security requirements Intruder Alarm, Door Access Control and Closed Circuit Television (CCTV) and is the Main contractor to a division of one of the largest retail chains in the United Kingdom. Status Alarms is an innovative company and will feed customer problems into the group and be amongst the first to offer back the considered solutions. Five Secure is the vehicle used for personal security and safety products that the group develops. Taking ideas or needs from either end of the spectrum, Five Secure is customer and market driven. It identifies a need that is not fulfilled before examining whether a product or service can be the key to supplying a solution. Attacking the issue at the other end; is there a solution that is already developed that is not being utilised as a solution to a specific problem? FiveSecure’s major project currently in development is personal safety of individuals, Lone Workers, Victims of domestic violence, vulnerable people in the community. All can benefit. All of these SOS products needed controlling from a bespoke monitoring platform. FiveConnect, is the name of the engine developed over three years to deliver both effective Customer Resource Management, high security and market leading versatility. Five Connect is able to control a single Smart Phone based Application through to tens of thousands of wearable solutions to deliver a wide range of safe and secure monitoring products. Monitoring can be done in a range of locations from a secure and state-of-the-art Police approved monitoring centre, through to the desktop or smart phone of the individual company’s owner or manager. The FiveAid facility is to ensure greater protection and to enhance speed of reaction to incidents involving users put into working teams. A person with the right authority will be able to place a number of users into teams. In the event of a team member activating an SOS alert the operator at the Alarm Receiving Centre (ARC) will receive an SOS alert giving location and identity as well as instructions for escalating the alert for attention by the relevant authority. In addition the operator may choose to send out a push notification to nearby team members showing the time of the alert and its location and asking them if they can respond. Any team member in the vicinity can indicate an intention to respond back to the ARC operator who will record this and may enter into a two way voice conversation with the responder for further guidance. It is also possible to identify members of a particular team who may have special skills such as First Aid Qualifications. Within the BSafeBSmart smart phone application FiveSecure can add the option of guard tour software. This allows regular checks on the progress of the tour with the addition of a fast acting SOS alert in the event of a problem. Man down options can also be utilised. The system is low in cost and its effective reporting is monitored 24hrs a day by an NSI Gold Standard alarm monitoring centre (ARC), running the FiveConnect secure monitoring platform. A menu option on the Guard’s BsBs smart phone app will give the user access to the tour. The tour route and timing will have been programmed into the FiveConnect monitoring platform, by a manager or supervisor with the appropriate level of permission. The FiveGuard will start by opening the phone camera and recognising a static fixed QR code. This operation starts the tour and the timers. The phone then returns to normal SOS watch. At each check in point the guard will activate a report tag on the phone and the phone camera will recognise the QR code sited at that point. If the guard is within the time period allowed then the monitoring platform will take no action and make no report. If the guard is overdue the monitoring platform will report an overdue alert on the operator screen and action will be escalated as required. An optional warning push notification can be sent to the guard warning of an overdue situation. After all check in points have been made the guard will arrive at the end point and the last QR code will check in and close the tour. If the guard feels threatened during the tour then the BsBs smartphone app will make immediate contact with the monitoring centre and help can be sent. If the guard is incapacitated for any reason then the smartphone app will send a Man down SOS report to the monitoring centre and the operator will take the appropriate action. The FiveConnect software is capable of sending out an hourly (or time set) push notification to each guard asking for a report on personal safety when not engaged in actual time guard tours. Entering a 3 or 4 digit code and then clicking OK on the notification will be sufficient to satisfy the request; inaction by the guard will cause an alarm to be raised on the monitoring software. If the Guard is in a duress situation then entering the code backwards will alert the monitoring centre the danger. The FiveGuard system is designed to be a high technology, high efficiency, low cost Personal safety system to suit Security personnel in the majority of situations. FiveCheck is a variation on the FiveGuard application. Many companies find themselves in a situation where Fire Doors need to be unlocked during working hours and then locked when the building is low staffed or empty. There is a real problem keeping track of doors being unlocked at the correct time and then making sure they are secured again. This could lead to prosecution under Health and Safety laws and Fire regulations if doors are locked when buildings are occupied. By placing a unique QR code at each door the responsible person can log that the door is in the correct mode. The FiveConnect monitoring platform will log the tour and if all doors are unlocked/locked to schedule then the tour will be logged as successful and no report made. If a tour is not made or a door is missed from the list then the responsible person will be informed and a notification sent to a manager or supervisor. The system can also be used for regular checking of key equipment or situations. A monitored electronic signal that a key piece of equipment, or location, has been physically checked on a regular basis. For example toilets and washrooms cleaned, fridge freezers closed, offices cleaned, secure cabinets locked. Our Sense & Detect product is currently in the final stages of development. Designed to be used by the NHS, social services and private healthcare professionals. The product is designed to provide level 1 health monitoring as an early stage diagnosis that can then have the correct intervention tailored to suit the patient. The system uses a series of devices that send data to a a control unit. The unit monitors daily life style and reports any variation that might give cause for concern. Monitoring can be put onto fridge doors to check that food is being taken. Movement detectors can sense if the bathroom and toilet are being used. Temperature monitors can make sure that homes are adequately heated. 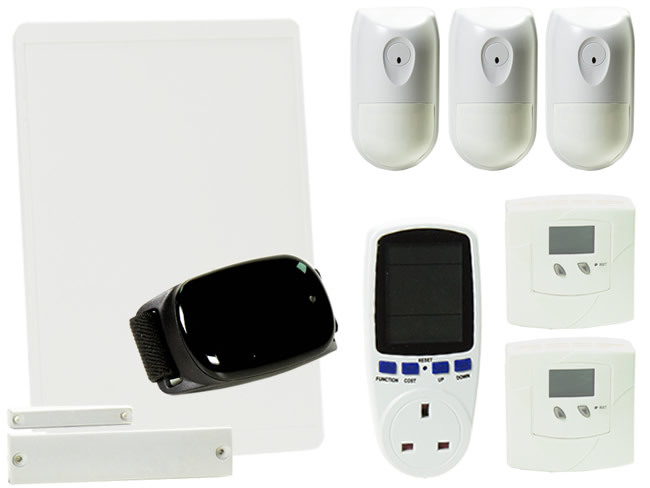 Icare is a range of safety and security products developed with resellers in mind. Primarily, our products are wire free using the latest RF technology. They offer reliability and speedy installation and service. Icare has developed over a dozen products all based on a wireless method of communications. Our experience in wireless technology dates back to the mid 1980’s developing security alarm products for a national UK retailer. Crimecracker is a world leading wireless alarm system for residential and small commercial installations. Offering remote monitoring and control with video confirmation of alarms it is both versatile and cost effective. Icare for Classroom is an audio visual system designed to protect teachers whilst working in the classroom. Normally passive the system activates on the press of a button and connects the teacher to an on-site control room and records the incident for later review. A personal protection App is also provided for exterior protection. I-Med is a self-contained secure recording storage processor complete with operating software contained within a tamper proof enclosure. It has three L.E.D. Indicators, GREEN, system operational, BLUE, successful enrolment, RED, Activation recording in progress. These indicators also act as a comfort visual for member of staff awareness. A high definition video audio transmission camera complete with audio channel (two-way communication) as required completes the system. It is a secure, non-intrusive and welcome addition to assisting staff in the workplace. I-Class is a self-contained secure recording storage processor complete with operating software contained within a tamper proof enclosure. It has three L.E.D. Indicators, GREEN, system operational, BLUE, teacher successful enrolment, RED, Activation recording in progress. These indicators also act as a comfort visual for teacher awareness. A high definition video audio transmission camera complete with audio channel (two-way communication) as required completes the system. It is a secure, non-intrusive and welcome addition to assisting Teachers in the workplace.